My name is Dawn Carreon and I’m 46 years old. I was born and raised in Charleston, West Virginia, USA. 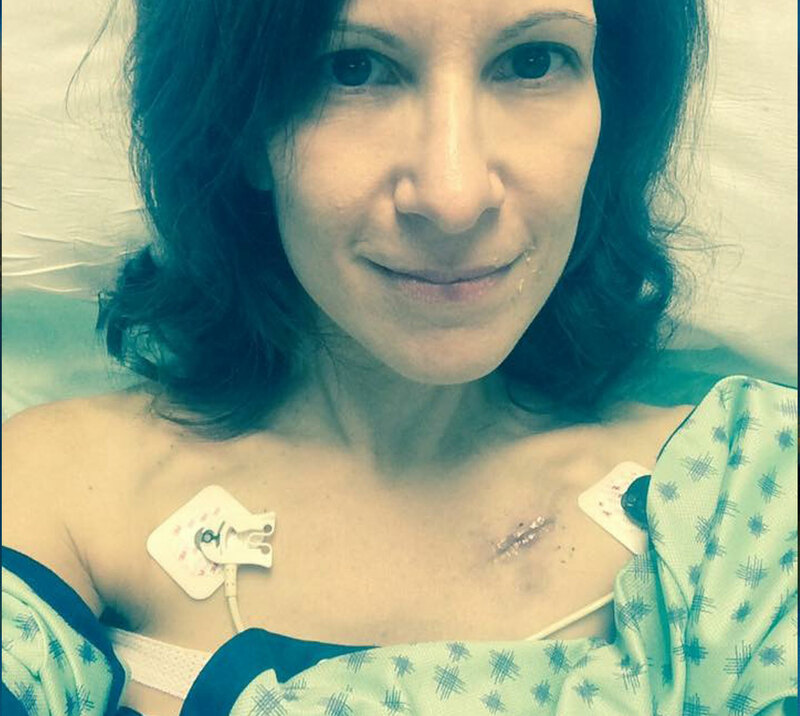 I had been spending a few days at the beach celebrating my 44th birthday, and as I was washing sand off in the shower at the end of the day, I felt a jagged edged lump in my breast. Instinctively, I knew it was cancerous; and a couple weeks later it was confirmed by scans and biopsies that I had an aggressive form of breast cancer that needed urgent treatment with chemotherapy, immunotherapy, and mastectomy; because the cancer was rapidly growing and spreading. Before the biopsies, part of me had a gut feeling that I had cancer but another part of me still hoped that tests would be benign. It was surreal for the first few weeks after it was confirmed I had cancer, and everything seemed to move so fast. I’d wake up in the middle of the night for weeks and would remember that I had cancer, and it would be a shock all over again. It was several months before I integrated that diagnosis into my reality. But, I still tend to see my life in two separate timelines: “before cancer” and “after cancer”. When I see photos of myself before cancer, I hardly recognize myself in them. It’s like looking at a picture of someone else. I’m also a lucky survivor of a rare and sometimes fatal pregnancy condition called placenta percreta. I want to live as fully and authentically as possible with these extra years I’ve been given, and to also connect with others and hopefully be able to use my experiences to cultivate deeper empathy and understanding for others in similar circumstances. When I heard about the Underwater Healer project via my mastectomy tattoo artist, Shane Wallin, it really resonated with me. I’ve always been drawn to the water, especially in times of stress. I was at the ocean when I felt the primary tumor; and the day I was officially diagnosed, I went straight to the beach to collect my thoughts and center myself. Before starting chemotherapy treatment, I also went to visit several bodies of fresh water and waterfalls in the national parks. When I’m seeking peace, my instinct has always been to turn toward the water, whether that’s the sea, or a waterfall, or a brook, or simply a fountain. I find water to be very soothing in all forms, so Underwater Healer seemed to be a good fit and another step toward healing. I also hope that other survivors will be inspired just as I was when I saw the beautiful photos of the other survivors that Erena has photographed. I was nervous about holding my breath. I’m not a strong swimmer and I cannot hold my breath for very long. If you’ve ever seen shows like “Fear Factor” where people are trapped underwater and have to get out in time, that is one of my biggest phobias. I am also easily chilled, so I was worried about being cold. I didn’t want to be a difficult subject for the photographer and I wanted to do well. As soon as I stepped into the water, I was pleasantly surprised with how warm it was, and that automatically had a soothing and calming effect that reduced my nervousness. I later learned that the pool owner in partnership with Erena, had taken great care to get the water temperature to a comfortable level, and I really appreciated the care that had gone into that. The whole process was very meditative. As I focused on my breaths and movements in the water, outside stressors and thoughts floated away. It was a very peaceful experience. I didn’t want to leave when my time was up. After the shoot, I felt more “connected”. Cancer treatment has had a fragmenting effect on my body and my quality of life. I suffer from chemotherapy-induced neuropathy in my feet that makes standing and walking painful. I also have post-mastectomy pain syndrome from nerves being cut during surgery. There are areas on my chest that are completely numb, but other areas that are hypersensitive to pain and pressure. Being in the water felt like my body parts were working in unison again. I didn’t feel so stiff and wasn’t constantly aware of pain or discomfort. On land, it seems like everything I do takes much more effort now than before cancer. Simple tasks can be very tiring. But being underwater felt like some of my “broken pieces” were put back together. Water is cleansing. As I shared above, I feel drawn to the water. Any time that I’m able to spend time in or near water, it feels like coming home. I also love the sounds of water. I like the rhythm and the timelessness of waves in the ocean, and the sounds of rippling brooks, and crashing waterfalls, and the pitter-patter of rain on the roof. I have some hearing loss and tinnitus that was worsened by chemotherapy. The sounds of water cancel out the tinnitus and is very restful for me. I sometimes sleep with a sound machine that mimics the sounds of the ocean, or streams, or rain. Water is essential to life. Without it, we die. I did have reduced pain the day after the shoot, and I wish I had access to a warm pool everyday. I suspect it would be a great form of healing and rehabilitation that would not be limited by the pain and sensation disturbances in my feet and chest, but I cannot tolerate the colder temperatures of a typical pool. Cold temperatures increase my pain levels. But, I could’ve happily stayed in the water all day at the Underwater Healer location. I absolutely recommend this to other survivors. All trauma can feel “heavy”. There is a weight that all survivors have to carry after a life-altering circumstance, and it can feel very burdensome to navigate life while carrying this weight, that many times is unseen by others. But, under the water, there is a literal effect of buoyancy and weightlessness. For a period of time, you can release the weights of life that you must carry on land and experience the freedom that comes from that.